Hello lovely readers! I bet you are asking… but why she hasn’t posted more Featured Bloggers on Fridays? Well, I have decided to this a monthly thing! It makes it more special to be Featured Blogger of the month and it allows me to better plan ahead for my blog. So here it is! 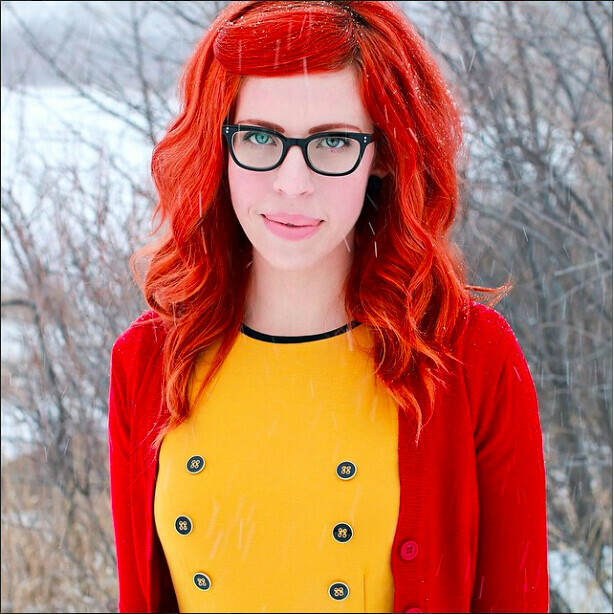 March Featured Friday Blogger is Heather from The Arbitrary Fox! I met this lovely lady through Instagram and I am oh so happy that we found each other. I saw her and I was OMG she is GORGEOUS!! I got captivated by her beautiful red hair and colorful fashion sense. Hello, I love color!!! Her vintage inspired style and color loving is something we have in common. She is so lovely and genuine! Hello! My name is Heather Gwinn. I’m 33 yrs fabulous! I live in the beautiful city of Colorado Springs, Colorado. I’m happily married with 2 amazing girls. I love exploring and being outdoors. I never get tired of wandering through the mountains. I love photography, crazy amounts of coffee, and everything crafty. Fashion is an extension of who I am. My character, my expression. It’s a little way for me to describe who I am to people without them having to say it. I’ve been fashion blogging on and off for about 2 1/2 yrs now. About a year ago I changed my blog name and have been working hard to improve and grow my new blog ever since. I started my blog for many reasons. Being an at home mom can sometimes get lonely and I wanted a way to connect with other ladies. I know so many at home moms seem to think fashion is all over the second they have kids. That doesn’t have to be true. We can still look and feel amazing, with or without kids. I love to share my style with others in the hopes to inspire. I know all you lovelies inspire me! Humm, I guess I’d describe my style as a modern twist on the 50-60s. Bold and colorful, definitely girly and a bit nerdy chic. I love boho styles but I’m know to occasionally dress completely different from the norm. I have an artist brain and it tends to go in a million different directions so I’ll give you just three dream jobs. To work from home as a successful blogger and or run a photography business, or sell my own art work (I love to craft/paint). There are so many people who inspire me but I’m not sure I can give just one person alone the credit. The people who inspire me the most are the amazing ladies I’ve met on Instagram! They are real, unique, reachable, relatable, and so wonderful to get to know. I could mention an actor or famous person but I suppose to me those people don’t seem real or are in another class of people that I cannot relate to. So to the incredible ladies I follow, you are who inspire me the most. Here are some pictures from beautiful Heather from her blog! *All pictures taken from The Arbitrary Fox blog.